Whether it is breakfast or lunch, this restaurant has more than adequate buffet spread, encompassing every cuisine from regional Indian to Western to Oriental. Their breakfast buffet is justly famous in the area, attracting corporates who hold early morning meetings here. There is a menu that comprises snacky meals like club sandwiches, as well as favourites like thin-crust pizzas. The real talent in the kitchen lies in the kebabs and the surprisingly home-style treats like Keema Mattar and Ghar ki Thali. nver book hotel pllazio.. melange... mr jatinder( supervisor) will create a spoil to your celebration.. never book this hotel on make my trip.. they will make you eat food dinner in your room not at hotel. I had the opportunity to dine at the Melange at the Pallazio Hotel, Gurgaon the other day with couple of my friends. It was a great experience to say the least. The interiors were pleasant and warm. What I loved the most about the ambiance was the quiet quality time I got to spend with my friends. The service was quick and the servers were calm and delivered the delicacies on our table with complete finesse. Here is what I ordered : STARTERS 🍔 Galouti Burger - Meaty and thick in the centre and soft on the outside. The galouti burger was something new that I tried and enjoyed every bite of it. 🍗 Murg Patroni - As a Bengali I am familiar with the different fish recipes cooked in banana leaves. This was quite a similar experience but with chicken in it. It was spicy and had a good portion. A must try for someone who hasn't had a Patroni before. 🍖 Cumin Lamb - shredded lamb in cumin seed sauce. It was beautifully tossed and I could taste the fresh veggies added in it. A good starter! 🍡 Khasta Paneer - anything with cottage cheese in it just makes it only better in taste. This was really tasty and crunchy. The paneer was flavourful. 🍄 Tandoori Mushroom - What I really enjoyed having at the Melange was their mushroom dishes. This particular dish was full of malai and tandoor roasted mushroom with a veggie filling inside. It was a treat to have this dish and I highly recommend it. 🍡 Dahi ke sholey - crispy bread with curd filling and fresh veggies. Quite light and refreshing. 🥡 Vegetable Dumpling - This is the only dish that I did not enjoy at all. This was just greasy and sticky. The dumpling didn't have a very distinct flavour to it. 🍄 Butter Pepper Garlic Mushroom - Another gorgeous and delicious mushroom dish. Love this shallow butter tossed mushroom. A rather delicious appetizer. MAINS 🍲 Sabz Diwani Handi - Flavourful and not oily at all. A great option for vegetarians. 🍲 Paneer Dum Anari - Tasted just like a butter chicken gravy however this one had paneer in it. It was beautifully made and was very tasty. 🍲 Pindi Choley - A typical Punjabi dal and they matched my expectations with this one. It was spicy in taste and thick in consistency. Just perfect! 🍲 Dal Makhani - creamy and smooth in texture. A good choice for a dal. 🍲 Mix Vegetables in Black Beans Sauce - what I loved about this was that the veggies were really fresh and crispy. The sauce was creamy too. With these we were given assorted breads and freshly steamed rice. DESSERTS 🥧 Boondi Tiramisu - A rather unique combination if you ask me. Something that sounds bizzare but tastes heavenly! 🥧 Orange cheesecake - It was my favourite of all the dishes/desserts I tasted at the Melange. Sour but creamy, a beautifully made dessert. Loved every bite of it! 🍫 Chocolat Ducote - A chocolate crumble bottom with mouse and a chocolate doughnut. Delicious to say the least. 🥣 Chena Kheer - Thick and creamy in consistency. Topped with grated pista. 🍫 Chocolate Shondesh - The goodness of Gur and chocolate combined in to a dessert that is not only mouth watering but delicious. I'd love to have another meal here sometime soon. In my opinion the Melange is a good and fancy place to have a date either with your loved one or a chill lunch with your family to celebrate something special. 17th March, 2018 Located in Sector-29, Gurgaon, it's a beautiful property. I was there for Dinner date and I must say this place made it a really good date. The service was indeed commendable. Started with a mocktail and vanilla shake and it was really a good start. Coming to the food, we had the following: 🔹Honey Mustard Potato wedges: it was more or less like honey chilly potatoes with less of chilly and had very prominent taste of mustard. I loved the crispiness of the potatoes. 🔹❤️Makhmali Kebab: as the name says makhmali the kebabs were trully makhmalli had khoya in it and was a delight for the vegetearians. 🔹❤️Mutton Kakori Kebab: this was melt in the mouth kebabs. Do try these too. 🔹❤️Chichken Chapali Kebab: this was the best kebab I had till date. Trust me. Juicy and delicious it was. Had Pomegrante seeds in it and it’s definitely a must have. The Kebabs were served with fresh coriander and mint chutney. Tandoori Bharwan Khumb: this was tandoori Mushroom filled with spinach and cheese. It was also good. 🔹For the main course, we had Dal tadka, paneer long lata, jeera pulao and assorted breads. And there was nothing disappointing at all. 🔹Now comes the best part i.e. desserts we had dessert platter which had Boondi Tiramisu, Orange Mousse cake, hichook, kheer, ananas champ and chocolate sandesh. Every single thing was delicious especially the boondi tiramisu and hichook. Overall, I loved the service, the food(WHATEVER I HAD) and the ambiance too. Definitely, going back again. 👌 PS: MY REVIEW IS BASED ON MY PERSONAL LIKING. Eighty two keys Boutique Hotel THE PLLAZIO, located near the Highway in Sector 29, Gurugram is one of the best Boutique Hotels around. The entrance itself is quite inviting and the Lobby has its own charm, artistically done up, lively. Adjacent to Lobby is the Multi cuisine restaurant, MELANGE, which is again beautifully done up with artistic yellow lights, hanging lights, wall paintings, artefacts. With approx hundred and fifty covers and alfresco seating facing nice manicured garden, is surely a place must visit. At a recent visit to this place, where there are three live kitchens, at this restaurant MELANGE relished delicacies, some of them were quite innovative with excellent presentation. Had a very refreshing MOJITO to start with. LABNESSE MEZZA PLATTER…..Falafel, Lamb Kibbeh, Baba ganoush, Hummus…..just perfect and nicely plated. KHASTA PANEER……was really crisp, VEG GALOUTI with BAKHARKHANI ROTI……Nice, soft, delicate Galouti Kebab presented beautifully. PESHAWARI SEEKH KEBAB, THAI CORN CAKE…..great, crisp , bite size were awesome. TOM YUM SOUP…..hot and sour soup with lots of veges, fresh lemon grass and Kaffir Lime flavour was excellent. LAL MAAS, DAL MAKHANI, ANARI PANEER with assorted Indian breads, relished to the core. 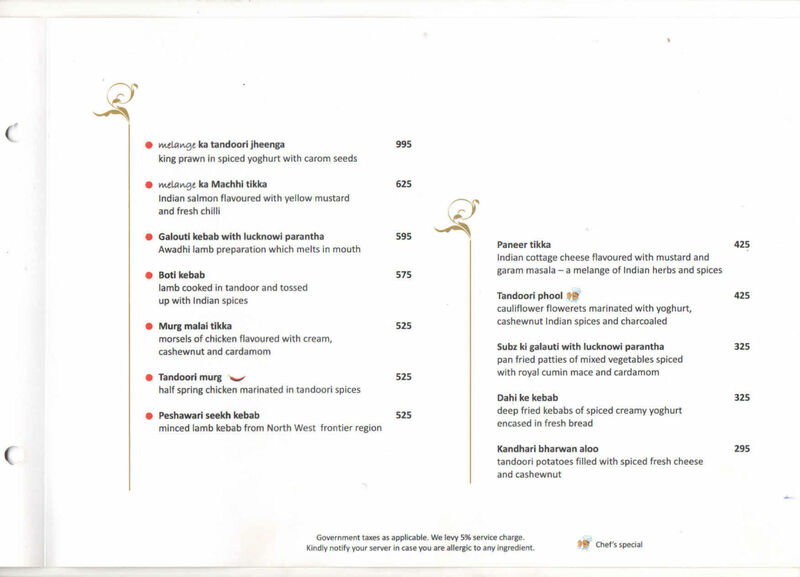 Had tried quite a few desserts, CHEESE CAKE…..was delicious with excellent presentation, CHOCOLATE DUCAT…..found it a bit dry, BAKED RASGULLA….had it for the first, COCONUT MALAI, DOUBLE KA MEETHA…..were good. Very courteous and humble ….Director Sales & Marketing Rohit Jhingan, Chef Dinesh, Restaurant Manager Omkar Singh with their team are there to give the guests a great experience. Ever scheduled a business meeting early morning but you have no idea where to place them? 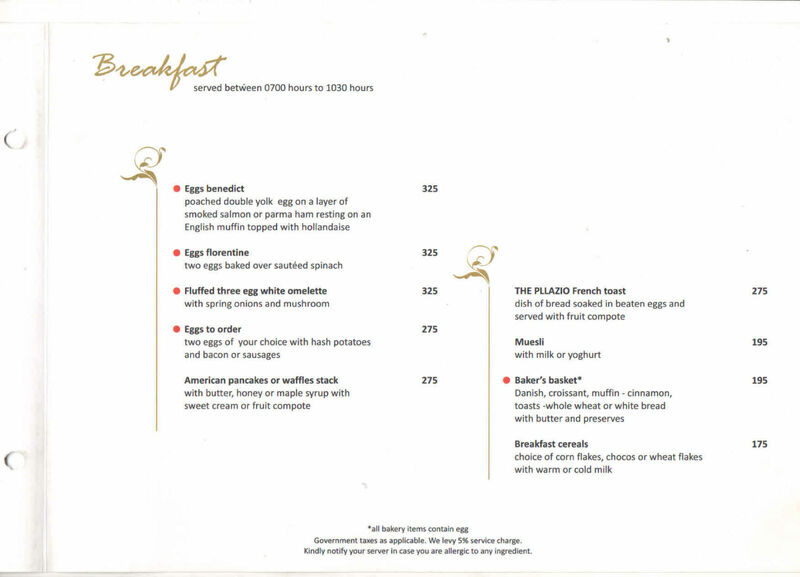 Look up for ‘Melange’ at Pllazio Hotel, Gurgaon, for the perfect solution. Located at this beautiful hotel washed in pale pink, it is magnificently made. Restaurant is stylish and contemporary in design. The spacious room is designed in a way to allow freedom of movement. The design is elegant, chic and done in tones of chrome yellow and dark brown. As the restaurant open its doors at very early in the morning you can slip in for delicious breakfast with your partner or even schedule a business appointment there. Their breakfast buffet spread is famous and accurately so. The variety you will get here will pleasantly surprise you. The breakfast and lunch display pulls lot of clients in hope of delicious food and flawless service. 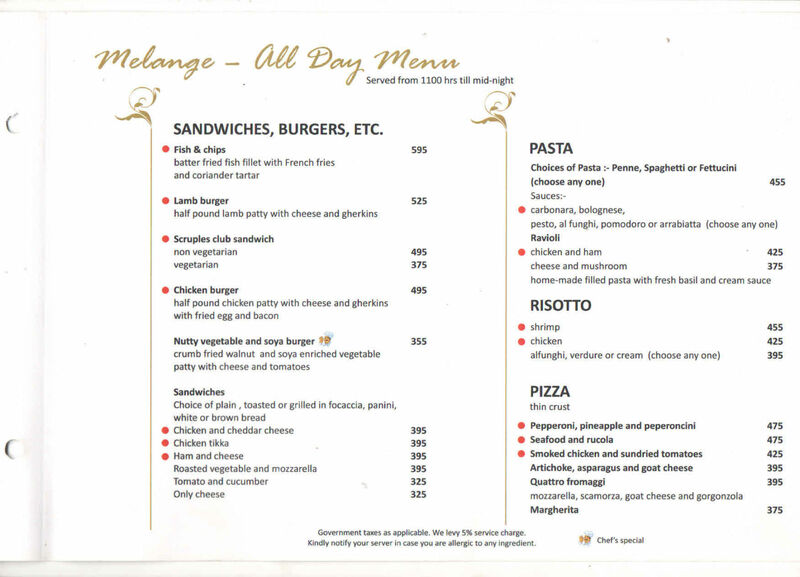 You will not be disappointed if you choose to visit Melange whatever the occasion is. Melange dishes out lip smacking world cuisine. 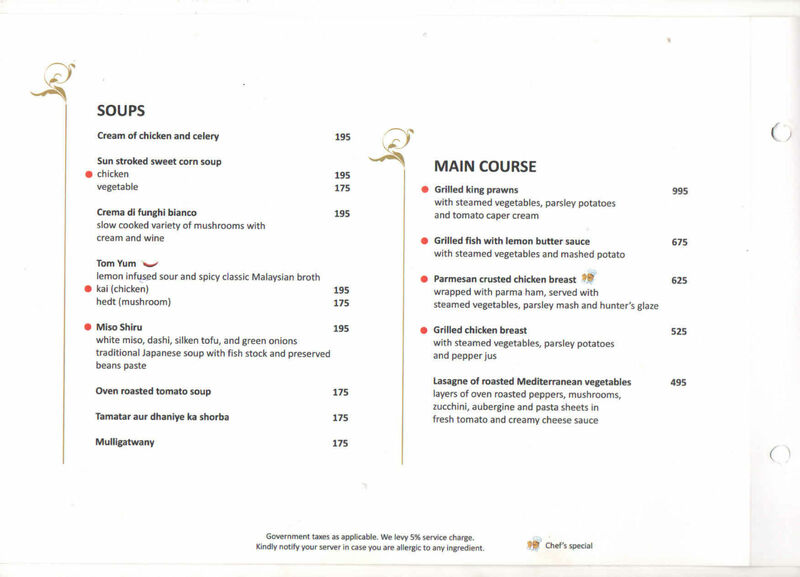 The menu travels all over the world picking the best of the dishes on the map. 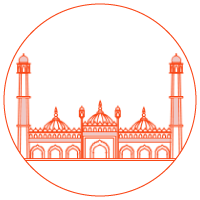 The morning menu reflects fulfilling breakfast like eggs, omelette, French toast, muesli, baker’s basket, breakfast cereals, south indian fare, poori-bhaji and parathas. 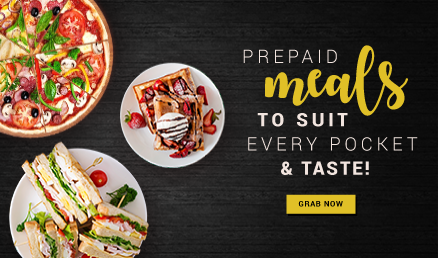 For light lunch opt for sandwiches, burgers, pasta, pizzas and risotto in various flavours. Appetizers like Caesar salad, shrimp tempura, Indonesian chicken satay, Cantonese dumpling basket, paneer tikka, boti kebab, kandhari bharwan aloo, tom yum soup, thai spring salad, melon & feta cheese salad, dahi ke kebab, tandoori phool, galouti kebab and macchi tikka will kick start the menu on the right note. 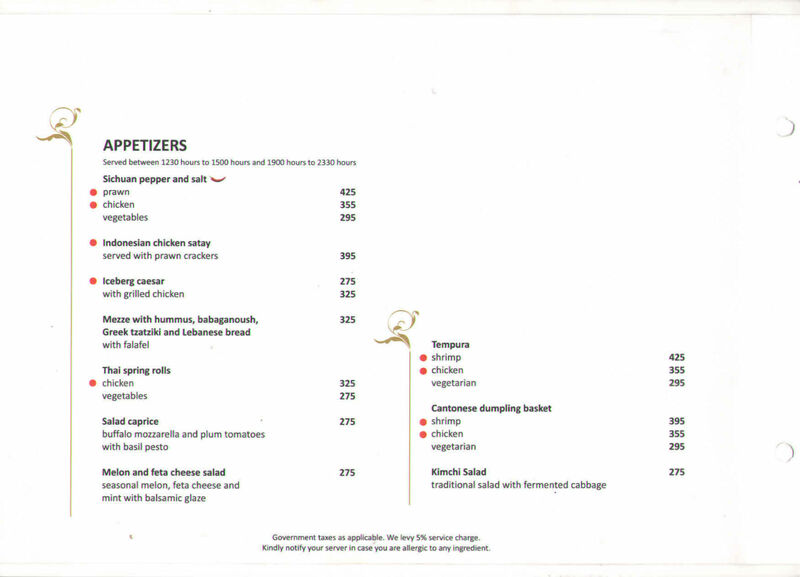 The mains such as grilled king prawns, kadhai paneer, chicken chettinad, pindi chana, Andhra fish curry, keema mutter, lasagne, grilled chicken breast, roganjosh, home style chicken curry, thai curry, Sichuan lamb chilli garlic and wok fried cat fish in Singapore chilli sauce, will impress you endlessly. 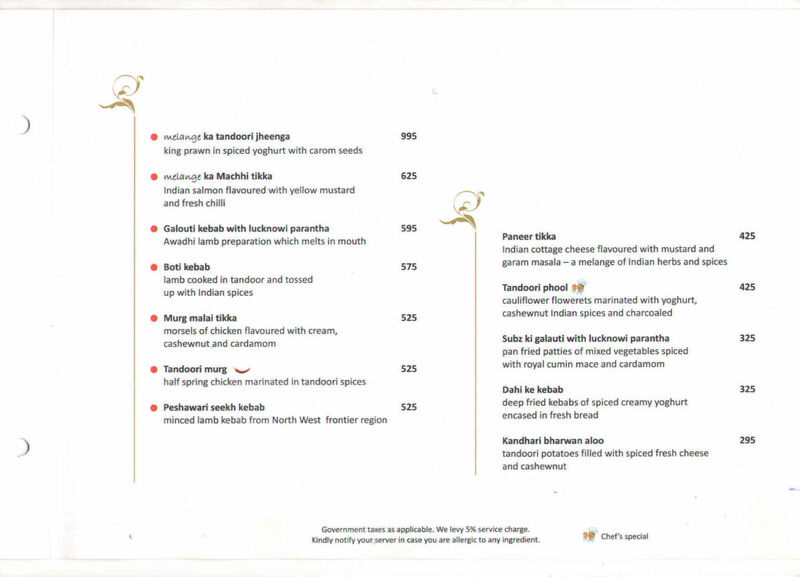 To accompany the mains, noodles, rice and indian flatbreads can be asked for. For quick meal order for bowl meals. They are a one stop culinary delight. Commence the meal at Melange by tasting the mouth-watering desserts such as, new York cheesecake, tiramisu, tilla kulfi, gulab jamun, seasonal fruits and ice cream. The meal can be washed down by selection of beverages. The service at Melange is efficient and quick. The staff will politely welcome you and be attentive to your every need. In seventeen hundred rupees only, you along with your companion can enjoy all the benefits of this wonderful restaurant.